You think you know what hard work is until you talk to someone working in Houston, Texas, or anywhere in Florida this month. There are trees down and trash is everywhere. It’s really, really hot. And there are mosquitoes. The workload is daunting. We spoke with pool service professionals operating out of Texas and Florida to get a sense of what they are dealing with. 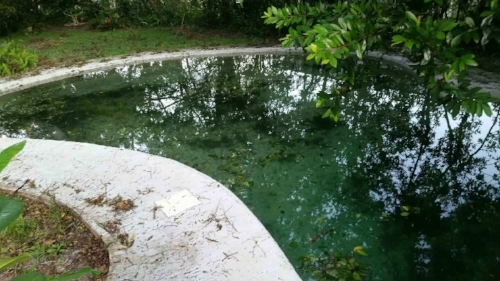 According to Jim Jacobsmeyer, owner of Sunchase Pools and Spas, in Houston, Texas, it’s a mess. “From what I’ve seen, everything is trashed, and in most cases, the pool is the best part of everything,” he said. Jacobsmeyer, whose iPhone has a black screen from the half a dozen times he’s slipped through the sludge, says that it can be a challenge keeping your feet while trudging through people’s yards. “The trash around here completely fills yards, on both sides of the streets, from one end of the street to the other,” he said. Jacobsmeyer works where the Buffalo Bayou River overflowed in Southeast Houston. They experienced 6 to 8 feet of water, and one of his biggest challenges is equipment damage. He estimates that up to half of all the pools in Houston were damaged during the flooding. With so many pumps and electronics underwater, service technicians have been forced to replace the motors. The local pool equipment distributors are running out. For Kevin Bogle, owner of Yellow Fin Pools in Houston, the hurricane brought more rain than he’s ever seen in his life. His company resumed normal operations about two weeks after the hurricane and some of those pools were still underwater at that time. Bryan Norris, owner of Norris Pools in Houston, has additional concerns about the dirty waters. The biggest problem Gary Crayton is facing in Houston is getting his service techs to their routes. Crayton is the CEO of Bay Area Pool Service with operations throughout the South. His business was affected by both hurricanes. “It’s been three weeks since Harvey and we still have routes we haven’t been able to get to because of the persistent flooding there,” Crayton said. In Florida, the situation is bad. The cleanup is compounded by the sweltering humidity, heat and, in most places, lack of electricity. And while it is not as scorching as in August, it’s still Florida in September. “It feels like anywhere from 104° to 115°. But not 115° like most people understand. You walk out the front door, and you’re lucky to get to your car without being drenched in sweat,” Scott said. Derric Raymond, owner of Raymond’s Custom Pools in Orlando, Florida, spoke to us from a wet cell phone that was so difficult to hear from it was almost useless. Raymond was about 15 miles east of the eye of the storm and his area got hit hard. While none of his customers’ backyards actually flooded, he said that almost all of the pools were damaged in some way. Since Hurricane Irma, he has had many customers request draining their pools, but he is steadfast in his refusal until the water table goes down. For now, service techs say that there is a ton of debris. Pools are filled with branches, leaves and furniture. Everyone is behind. According to Scott, it takes anywhere from 5 to 10 times the normal amount of time to clean some of these pools. Scott calls the work “headlamp pool service” because they are cleaning pools well after it gets dark. He anticipates working over 13-hour days for the next couple of weeks. Todd Starner, owner of Starner Pools in Bradenton, Florida, agrees that the work is tedious and time-consuming. He’s been dealing with equipment cages crushed by trees and commercial pools that take more than five hours to clean. In spite of the damages and massive cleanup, many Florida service techs consider themselves fairly lucky, particularly on the west coast where they did not experience as much storm surge as had been anticipated. And many independent service firms are working together to clean up the mess. “Two Hammerheads are better than one,” Starner said. Prior to Hurricane Irma, Starner’s IPSSA Region 11 had organized care packages to send out to Houston’s hurricane victims. Now, he says, it looks like those are going to stay home. Back in Texas, Norris says that he’s been talking with the IPSSA BORD to determine what they can do to help the community. “The show of support here has just been phenomenal,” he said. Norris spent the nights following Harvey listening to airboats from Louisiana evacuating people in nearby neighborhoods. Photos courtesy Gary Crayton of Bay Area Pools & Spas in Tampa Fla.